Player salaries in 2015 have reached unprecedented heights, and with hundreds of millions of dollars being pumped into professional sports teams via marketing and television, it is a lucrative time to be involved in the sports agency profession. The firms featured in this list have (collectively) negotiated a total of $37.6 billion in player contracts, which has netted these agencies a total of $1.85 billion in commissions. As of September 2015, the CAA has earned $257 million in commissions from sports contracts. The agency represents 307 athletes in the fields of baseball, football, golf, basketball, and hockey. CAA has their headquarters based in Los Angeles, California, and the total value of contracts under their management is $6.43 billion. Their top sports agents are Brodie Van Wagenen and Tom Condon. The Boras Corp is named after superstar agent Scott Boras, and it comes at no surprise that he is their most lucrative sports agent. As of September 2015, the firm has earned $117.1 million in commissions. The Boras Corp focuses solely on the representation of major league baseball players and has approximately 69 players under their stewardship. Headquartered in Beverly Hills, California, Relativity Sports represents 278 athletes in basketball, baseball, and football. Top agents Eugene Parker and Dan Fegan have helped the firm earn more than $114.2 million in commissions, and the total value of contracts under their management exceeds $3.28 billion. Led by top agents Joel Wolfe, B.J. Armstrong, and Thad Foucher, the Wasserman Media Group actively manages more than $2.33 billion in sports contracts, which has netted the firm $113.5 million in commissions. WMG represents more than 400 clients in the sports of golf, soccer, basketball, baseball, and football. 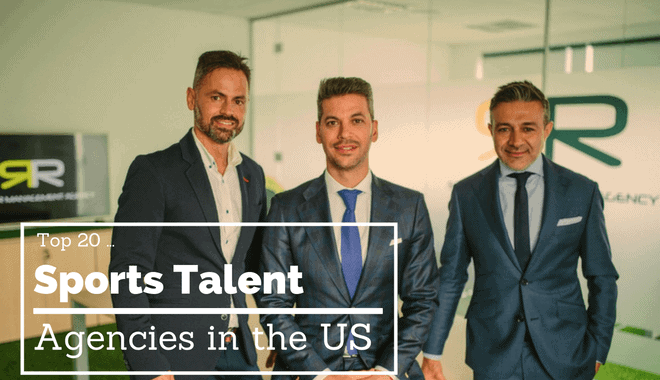 This East Coast sports talent agency is headquartered in New York City, New York, and they represent more than 90 clients in the fields of golf, basketball, and baseball. In particular, they represent some of the hottest young talent in baseball, including Freddie Freeman and Clayton Kershaw. To date, the firm has earned more than $93.9 million in commissions from the contracts they manage. Octagon is one of the fastest rising sports talent agencies in the country. Their top agents, which include the likes of Mike Liut and Scott Pucino, have helped the agency earn more than $94.5 million in commissions. They represent almost 200 hundred players in the fields of hockey, basketball, baseball, and football. Their headquarters are located in New York City, New York. Although originally founded in Canada, Newport Sports Management has begun making inroads into the United States. Their primary focus is on the representation hockey players. Currently, the firm manages more than $1.36 billion in active sports contracts, which has netted them a total of $54.5 million in commissions. As of September 2015, Lagardere Unlimited has earned more than $43.9 million in commissions from the nearly $1 billion in active contracts that they manage. The firm represents more than 65 players in the sports of tennis, golf, hockey, basketball, baseball, and football. The firm’s top agents are Steve Loy and Joel Segal, and they recently relocated their headquarters to New York City, New York. Founded by top agents Sam and Seth Levinson, ACES is a sports talent agency located Brooklyn, New York. The firm solely represents major league baseball players. They currently have more than 50 athletes on their roster, and total value of contracts under their management exceeds $845 million. These contracts have garnered the agency a total of $42.3 million in commissions. As of September 2015, The Legacy Agency has earned $32.9 million in commissions. They negotiate contracts for more than 50 athletes in the sports of golf, baseball, and football. Legacy is also bolstered by strong coaching and broadcasting practices. Their headquarters are located in New York City, New York. SportsStars is one of fastest rising sports talent agencies in the United States. They focus solely on the representation of football players, and their roster currently includes more than 112 players. Led by veteran agents Brain Mackler and Alan Hermann, the agency has, to date, earned more than $17.9 million from the contracts they oversee. MVP Sports Group is led by superstar agent Dan Lozano and is the epitome of a boutique agency. The firm currently represents 25 clients with a total contract value of $943 million, which has earned the group $33.4 million in commissions. Just a few of the famous faces they represent include Alex Rodriguez and Carlos Beltran. Although small enough in size to be defined as “boutique”, Priority Sports has established a name for themselves in both football and basketball. The group is helmed by veteran agents Michael McCartney, Ken Zuckerman, and Mark Bartelstein. Headquartered in Chicago, Illinois, Priority Sports currently represents more than 95 clients and, to date, has earned $33.2 million in commissions from the contracts they manage. Athletes First calls Laguna Beach, California home, and David Dunn, one of the most dynamic agents in sports today, currently represents over 65 active NFL players. The total contract value under Athletes First’s management hovers at $894.3 million, which has netted the up and coming firm $26.8 million in commissions. This sports talent agency focuses solely on the representation of football players. Led by top agent Drew Rosenhaus, RSR continues to be a dynamic force in the world of sports representation. The firm’s client list includes many notable names, like Greg Hardy, Joe Haden, and Antonio Brown. To date, the firm has earned $23.9 million in commissions from the contracts they have negotiated. BDA Sports Management is based out of Walnut Creek, California, and the firm and its clients take considerable pride in their humanitarian efforts via using basketball as its platform. Notable clients that the firm represents include Klay Thompson, Steve Nash, and Joakim Noah. As of September of 2015, the firm has garnered more than $20 million in commission from the $500.9 million in contracts that they have negotiated. Focusing exclusively on the representation of football players, this long established sports talent agency only represents 50 clients; however, they still pack a powerful punch because the contracts negotiated by the agency are currently worth more than $600 million. This has netted them a total of $18.6 million in commissions. The group is currently led by top agent Bus Cook. Just like their top client, Kobe Bryant, the Landmark Sports Agency does not require any introduction. To date, the firm, which is headquartered in Los Angeles, California, has negotiated multiple active NBA contracts that are currently valued at over $420 million. All of this hard work has netted the agency more than $17.5 million in commission fees. Based out of Edgewater, New Jersey, ASM Sports focuses exclusively on the representation of NBA basketball players. Led by top agent, Andy Miller, the firm had negotiated multiple contracts that valued at $422 million. With more than 36 clients on their roster, ASM has earned $15.3 million in commission fees. Last, but not least, is SportsTrust Advisors. Having earned more than $13.5 million in commission fees and negotiated more than $454 million in NFL contracts, the firm has become one of the premiere names in NFL contract negotiations. STA’s current roster includes DeMarcus Ware, DeMarco, Murray, and Ryan Clady.